In the course of investigating the surface of Mars, NASA has uncovered some rather interesting and curious rock formations. And if once in awhile those rocks should resemble something odd and Earth-like then one should expect the media maelstrom that follows. And the sudden appearance of what people referred to as the “jelly doughnut” rock in January was no exception to this rule. 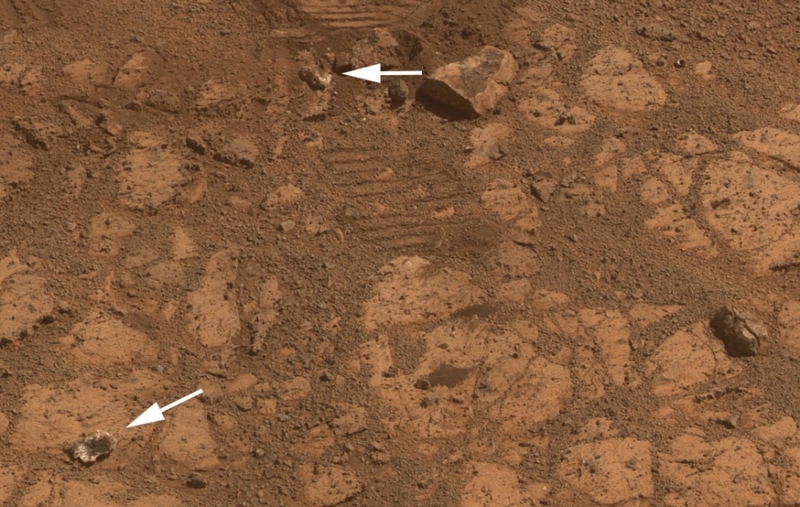 Much the Martian “rat” discovered last summer, the appearance of the doughnut rock was met with all kinds of speculation. The rock – now dubbed “Pinnacle Island” – first appeared on January 8th in a series of pictures taken by the Opportunity Rover. Measuring only about 4 centimeters (1.5 inches) in diameter with a noticeable white rim and red center, the rock quickly picked up the nickname “jelly doughnut”. 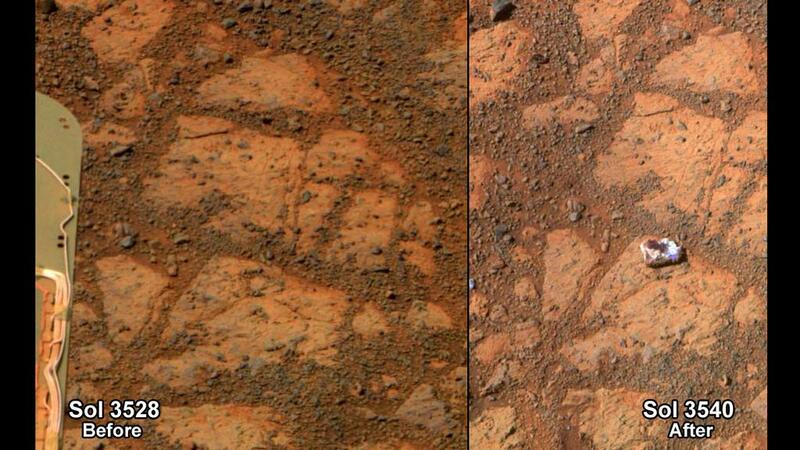 According to pictures taken just four days earlier by Opportunity, during which time it had not moved an inch, that area had been free of debris. In response, wild theories began to emerge, with some thinking it was an indication that rocks were falling from the sky. Others, looking to explain how something so odd in appearance could suddenly have appeared, claimed it was a heretofore undetected Martian surface beings. Luckily, the ongoing work of mission scientists solved the by determining that the rock was actually created by an “alien invader” – the Opportunity Rover! 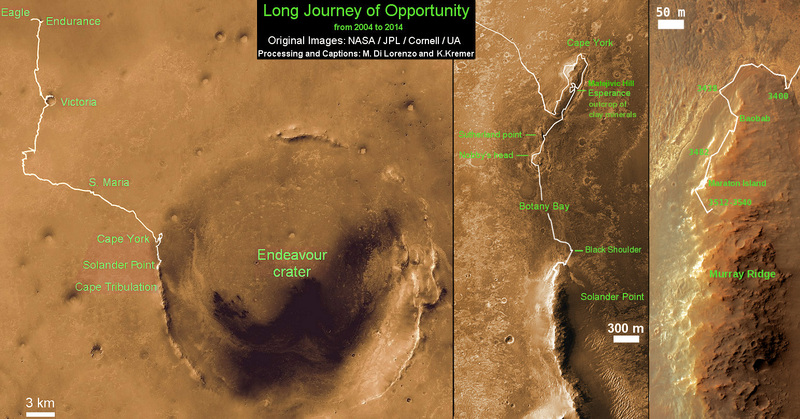 Apparently, the mysterious rock was created when Opportunity unknowingly drove over a larger rock formation on Solander Point, where she is currently located. It then crushed the rock, sending fragments across the summit. One piece, the ‘Pinnacle Island’ fragment, unwittingly rolled downhill where Opportunity caught it on camera a few days later. This explanation became apparent when the Opportunity was moved a tiny stretch and took some look-back photographs. Another fragment of the rock that was eerily similar in appearance to the ‘Pinnacle Island’ doughnut appeared, indicating that it had left a trail of such debris in its wake. 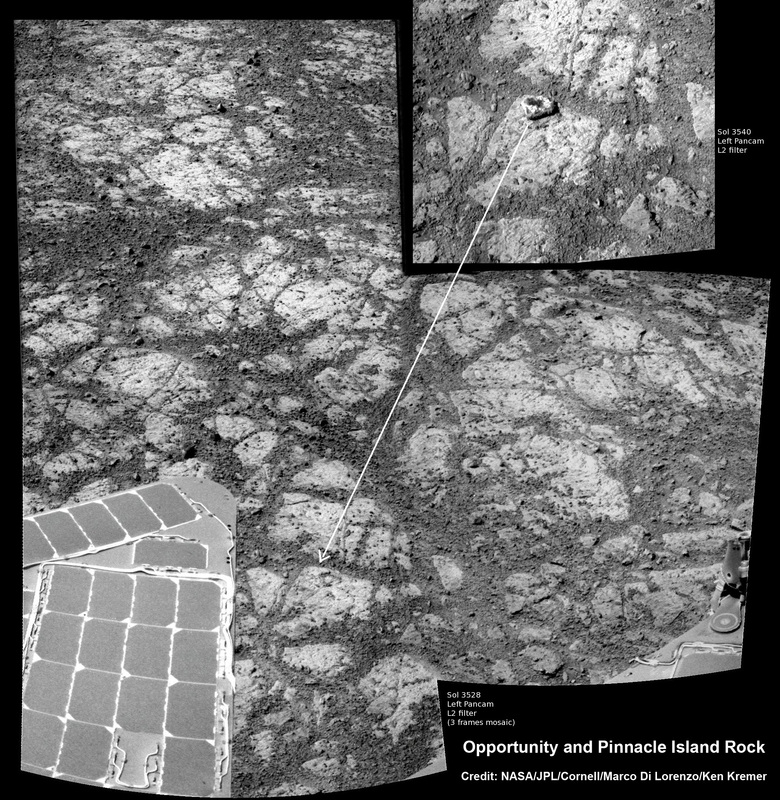 Once we moved Opportunity a short distance, after inspecting Pinnacle Island, we could see directly uphill an overturned rock that has the same unusual appearance. We drove over it. We can see the track. That’s where Pinnacle Island came from. [these] water-soluble ingredients were concentrated in the rock by the action of water. This may have happened just beneath the surface relatively recently, or it may have happened deeper below ground longer ago and then, by serendipity, erosion stripped away material above it and made it accessible to our wheels. The Solander Point mountaintop is riven with outcrops of minerals, including clay minerals, that likely formed in flowing liquid neutral water conducive to life – a potential scientific goldmine. Thus, the presence of such water-soluble minerals in this particular rock indicates quite strongly that the Opportunity brought it with her while rolling through the area. Meanwhile, on the opposite side of Mars, Opportunity’s younger sister rover Curiosity is trekking towards gigantic Mount Sharp and just crested over the Dingo Gap sand dune. She celebrated 500 days (Sols) on Mars on New Years Day, 2014. And a pair of new orbiters are streaking to the Red Planet to fortify Earth’s invasion fleet- NASA’s MAVEN and India’s MOM. So expect more surprises from the Red Planet soon enough, which will include more information on surface conditions and the history of Mars’ atmosphere and how it disappeared. 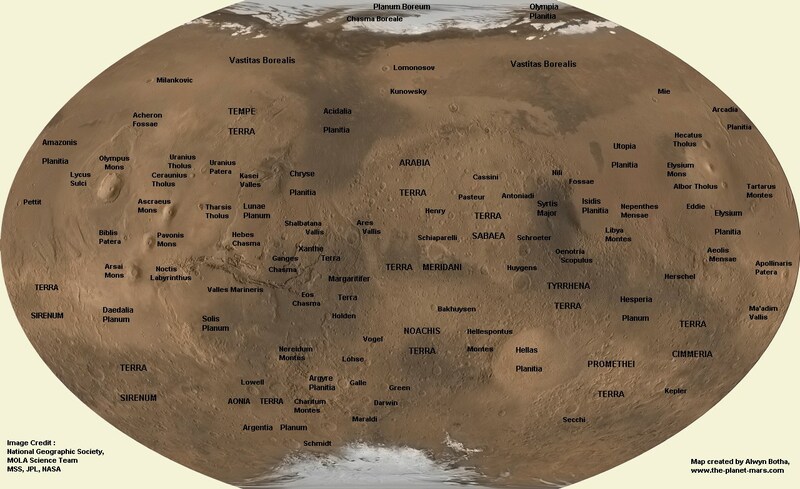 And maybe, just maybe, one of the rovers will uncover the existence of the long-sought after organic molecules – thus demonstrating unequivocally that life still exists on Mars.